This is a family favorite in my house. 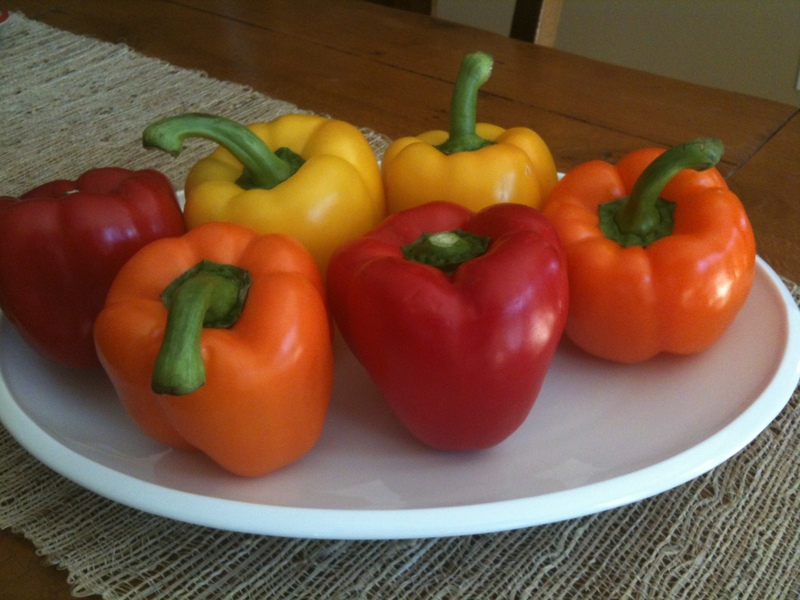 I use red, yellow, and orange bell peppers and precook them to get them nice and soft. 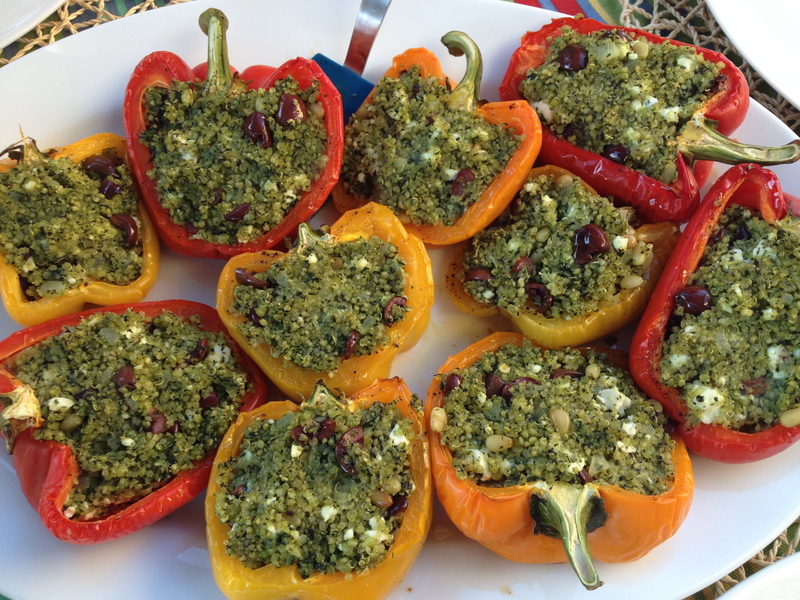 Then I stuff them with a mixture of quinoa, chopped spinach, kalamata olives, and feta cheese. I finish them off with a dollop of home made hummus and my favorite Trader Joe’s Cilantro and Chive Yogurt Dip. The quinoa is a great grain choice in a meatless meal because it gives you some protein. You also get some protein from the hummus. 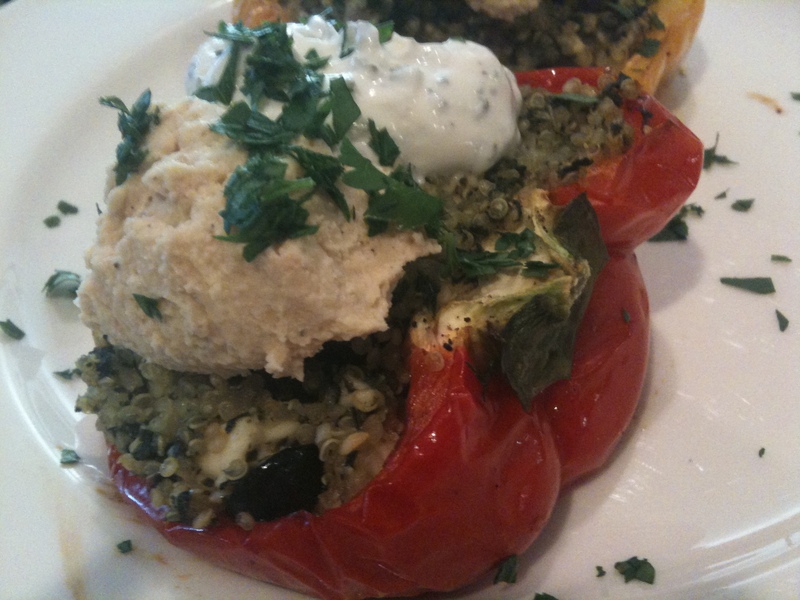 There is so much flavor with the olives and feta…this is really a great combination of ingredients. There are a few steps to this dish, but you can do them all ahead of time and refrigerate them until you are ready to heat them up in the oven. You can cut a couple of corners by using a store bought hummus or using frozen spinach (I like to use fresh and chop it small because my kids like it better that way). This recipe makes enough for my family of four with a little left over. Max has already called dibs on the left overs for his lunch tomorrow. You can use any color of peppers that you like. These are my fave…I don’t care for green! I cut them in half and clean out the seeds/veins. They get a drizzle of extra virgin olive oil and some salt and pepper before going in the oven. 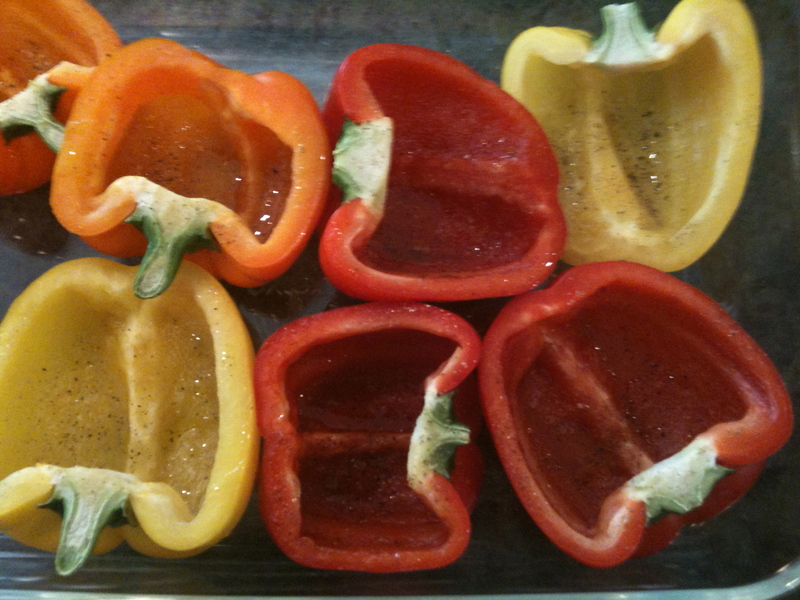 Cut your bell peppers in half lengthwise and clean out seeds and veins. Put in a baking dish with the cut side facing up (you will need 2) and drizzle with olive oil. Sprinkle with a little kosher salt and freshly ground pepper and bake for about 30 minutes. 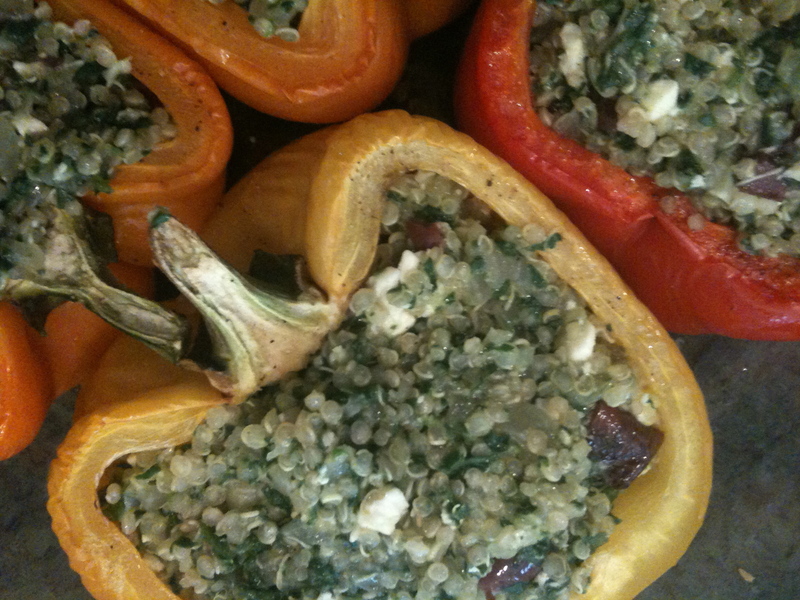 While peppers are cooking, cook quinoa in a small sauce pan. Make sure that you check to see if your quinoa is pre-rinsed…if it is not, you need to rinse if first. Combine the quinoa with the stock or water and bring to a boil. Cover, lower heat, and simmer for about 10 minutes. Drain any extra liquid left after it is done cooking. 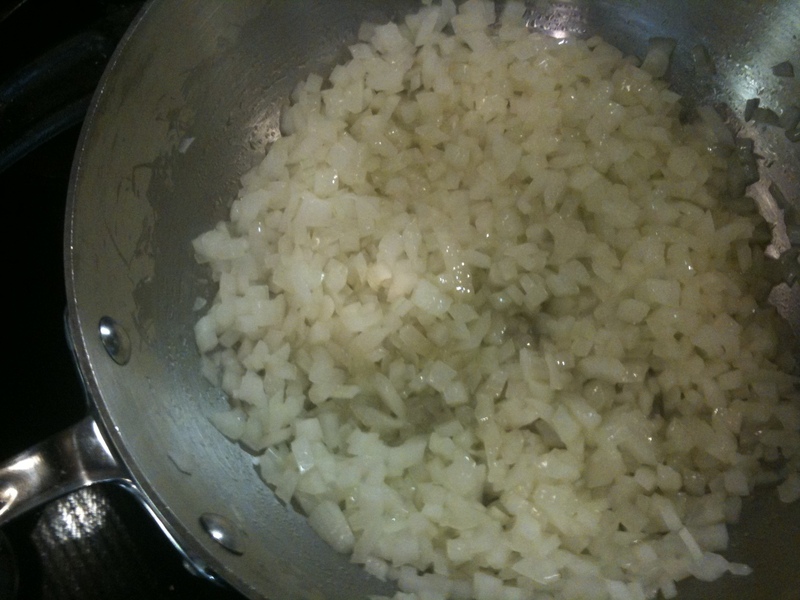 In a medium pan, saute chopped onion with some olive oil for about 10 minutes. Add garlic and saute for a few more minutes. 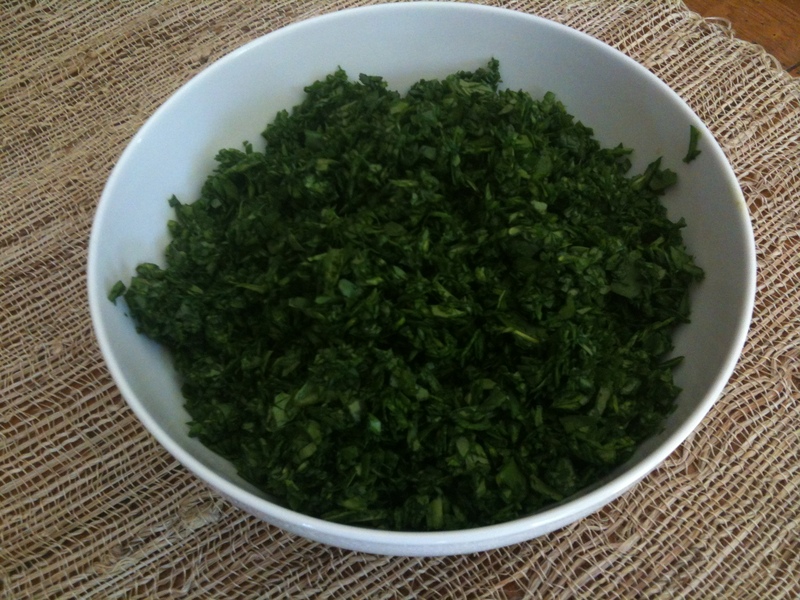 Add spinach and cook until it has wilted and most of the water has evaporated, just a few minutes. 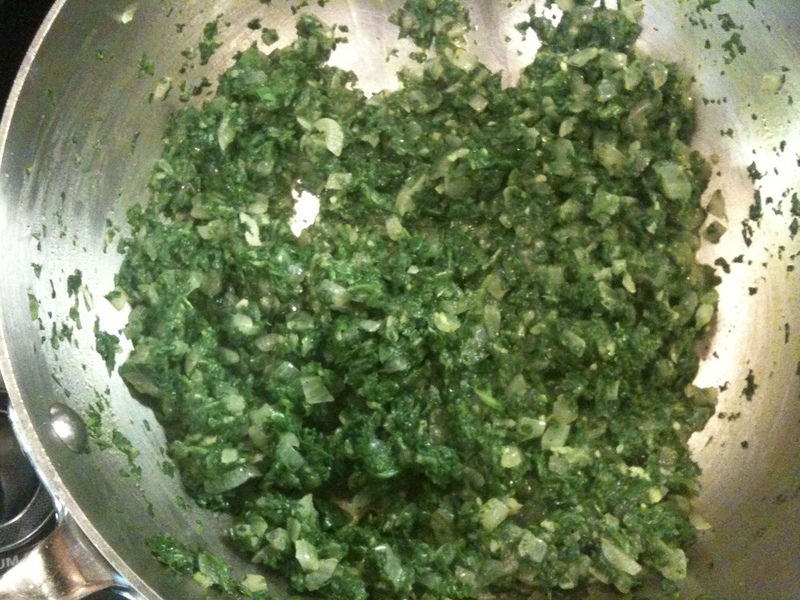 If using frozen spinach, turn off the heat and just mix it in to the onions/garlic. Season with salt and pepper (remember you don’t need too much salt…especially if you cook the quinoa in chicken stock. Also, the olives and feta add a lot of salt). Add the quinoa, olives, feta and pine nuts to the spinach & onions and mix well. Add the lemon juice and mix well. Taste to see if you need any more salt or pepper. 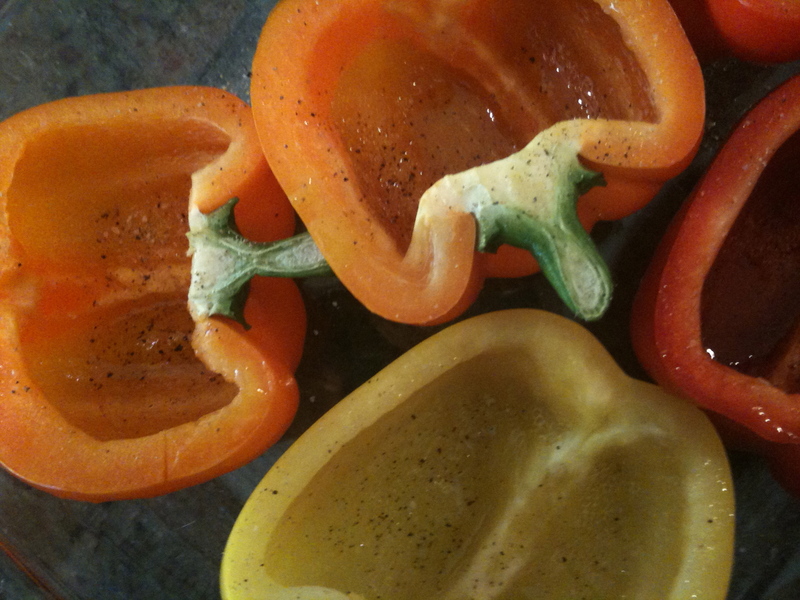 Remove the peppers from the oven, lower the oven to 350 degrees, and let them cool a bit. Stuff them with the quinoa mixture and return to the oven for about 20 more minutes. Since everything is cooked, they just need to cook until the peppers are as soft as you like them. 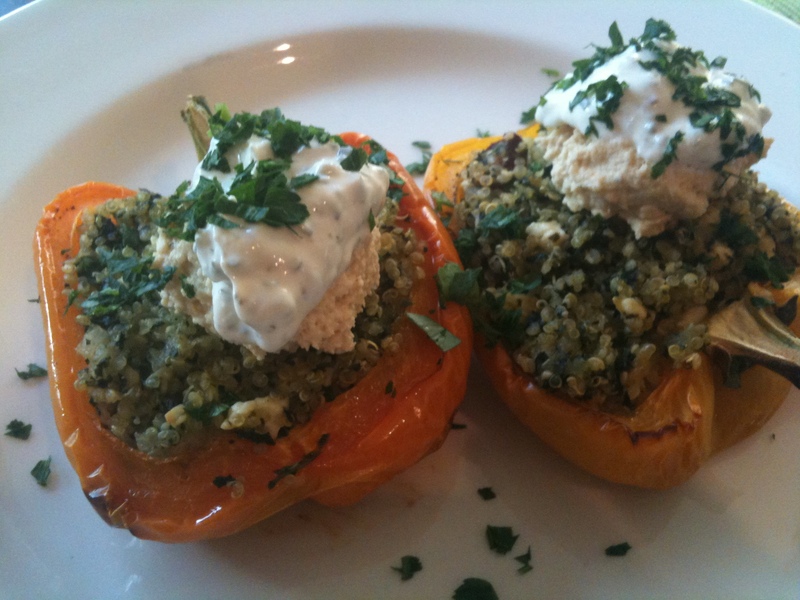 Remove them from the oven, let cool for a few minutes, and top with hummus and yogurt dip and garnish with parsley. 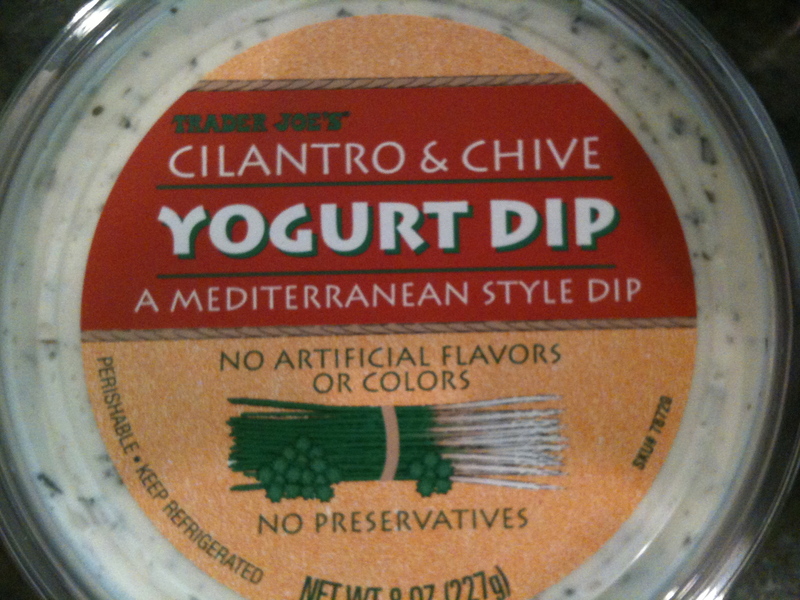 This dip is a staple in my fridge. So good on so many things! 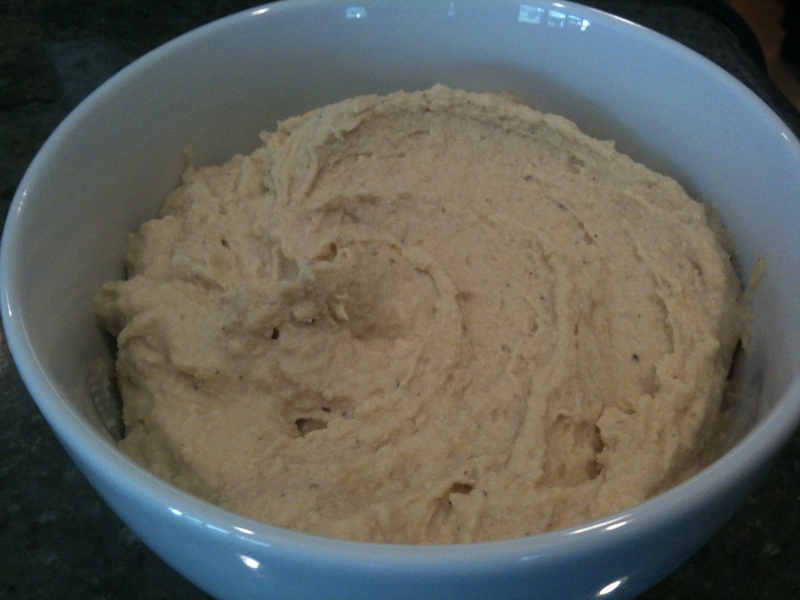 Put the beans, tahini, garlic, and lemon juice in the bowl of a food processor. Pulse until well blended, scraping down the sides as needed. Turn the processor on and add the olive oil slowly and blend until creamy. If it is too thick, add a little water 1 teaspoon at a time until it is at your desired consistency. For a little something to spice it up…add a couple dashes of Tabasco Sauce. OMG my mouth is watering! and its only 6am! Pingback: Quinoa Spaghetti (I usually call it Fauxghetti) | Haven't We Done This Before? 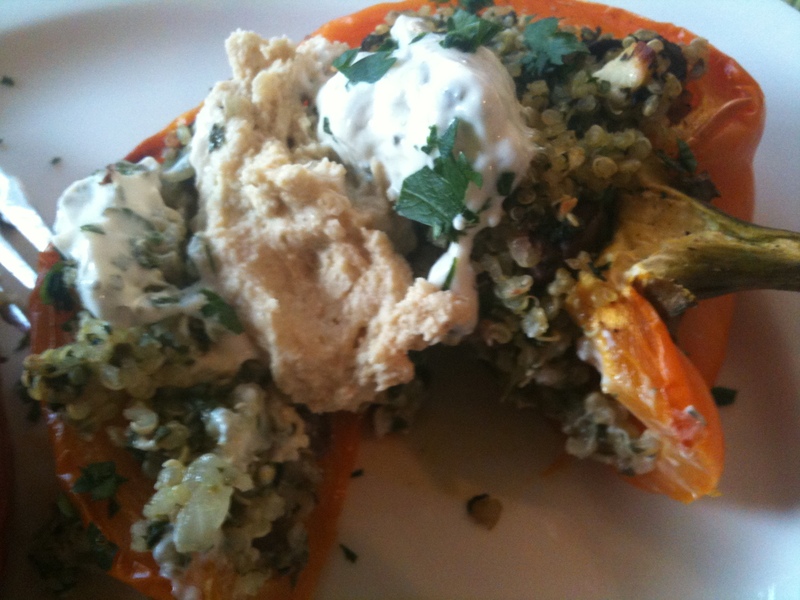 I made your quinoa stuffed peppers yesterday and my husband ate them right up. They were delicious!!!!! Thank you for something new and healthy. I’m so glad they were a hit! Thanks for trying them, D’Nan!